WBS Schedule Pro can be used by itself as a standalone project planning and scheduling tool. The intuitive user interface and visual nature of the charts used to create projects minimizes the learning curve needed to use more complicated project management software. It's easy to use with plenty of advanced features to effectively plan and manage even the most complex of projects. WBS Schedule Pro integrates with Microsoft Project and other Project Management systems to add features and capabilities not found in your existing tools. Leverage your current PM software by using WBS Schedule Pro as a Front-End planning system and as a way to produce powerful graphics of your existing projects. WBS Schedule Pro takes the complexity out of the Project Planning process while also providing presentation-quality WBS, Network and Gantt Charts that are second to none in the industry. What is WBS Schedule Pro? WBS Chart Pro is a Windows-based project management software application, produced by Critical Tools, Inc. out of Austin Texas, that is used to create and display projects using a Work Breakdown Structure (WBS) Chart. 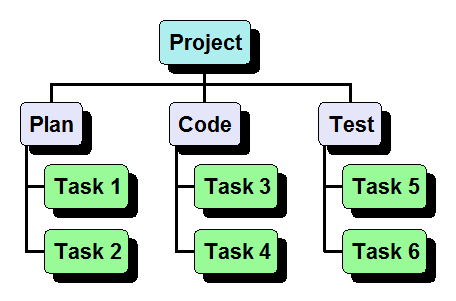 A WBS chart displays the structure of a project showing how a project is organized into summary (phase) and detail levels. Using a WBS chart is a more intuitive approach to planning and displaying a project. Plans created in WBS Chart Pro can be maintained and managed separately, transferred directly to Microsoft Project or transferred to any program that can read the “MPX” file format. You can transfer a WBS chart to Microsoft Project at any time with the simple click of a button. All of the information you entered in WBS Chart Pro is automatically transferred to Microsoft Project. Although WBS Chart Pro can work seamlessly with Microsoft Project you do not need Microsoft Project to use WBS Chart Pro as a standalone application. You can use WBS Chart Pro all by itself to create WBS charts like the one shown here. Use WBS Schedule Pro as a front-end planning tool for most any project management application whether it's a desktop or online system. Since it's so easy to create projects in WBS Schedule Pro it's an ideal way to populate your project management system of choice. Many Project Management tools lack the great graphic capabilities that WBS Schedule Pro offers. Use WBS Schedule Pro to create presentation-quality WBS and Network Charts by simply Saving to the XML file format and opening these in WBS Schedule Pro. A single user license is intended for installation and use by one person. Quantity discounts are listed below and apply when greater than 4 copies are purchased of the same product, in the same order. Prices do not include tax and shipping charges.